I am SUPER excited to be a part of the design team for the new Neat and Tangled challenge blog - Little Tangles. The Neat and Tangled design team and the Little Tangles team have come together for this welcome blog hop! The first challenge for the Little Tangles blog will begin on Thursday, November 15th, so make sure you put the date in your calendar. Don't worry if you don't have any Neat & Tangled stamps as yet, there will be a free digital stamp available on the Little Tangles blog and Neat & Tangled blog for you to use, Woo Hoo! Now back to the hop, you should have arrived my way from the fabulous Nina, but if not don't worry, the full blog hop list is at the end of the post. For my card today I used the fab sets, 'Little Tangles' (I just had to under the circumstances, lol), 'Fresh Blooms' and 'Just Hello'. I can't forget about the giveaway, 2 prize packages are up for grabs which will be chosen randomly from comments made, so make sure to leave comments on all the blogs for a greater chance to win. You have until Sunday, November 4th at 11:59pm EST to leave your comments. Next on the hop is Katie where I am sure she has something fantastic for you. I am going to put this card in the challenge with CAS-ual Fridays - Kraft On. What a strong color combination! Very pretty card! I love the color combo, gorgeous card with the beautiful flower! Those colors are awesome! Great card! What a great card! Love the bright colors and layout!!!!! Congrats on being on the team! :) So excited for you! Such a bold card! Love the black/turquoise/kraft combo. Great card! Oh the colors are SCRUMPTIOUS!! Gorgeous card!! I LOVE the flower!! Tracy, this is beautiful! I love the colors you chose! Thanks for playing along with us at CAS-ual Fridays! Great card! Love the aqua! I love your card, great colors too. This card is so eye-catching with that bright color! One of my favourite images Tracy. Absolutely stunning...love the color combo so much! Thanks for playing along with us at CAS-ual Fridays! FAB news Tracy - LOVE, LOVE your card too! I like the dramatic color combo! Innovative use of Kraft with those bold colors and that flower is so versatile. Love that poinsetta!! Awesome colors!! Just perfect! Wonderful card with great balance. Love the flower. Pretty card, I love the colors. 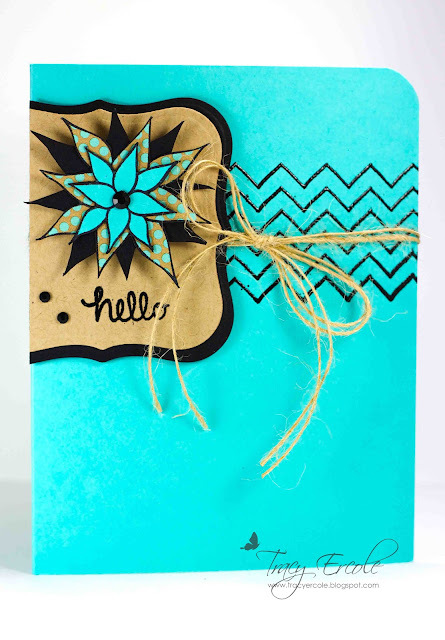 Black + turquoise + kraft = gorgeous! I love the black gems too. The whole thing is clean and it really pops. Chevrons make everything perfect....especially paired with this awesome bright color and that sweet flower! Wow, what a fun flower!!! Great colors! A bold and beautiful card, Tracy! This card is soooooo pretty, dearie!!!! Tracy, I adore the vibrant turquoise combined with the neutrals. Super striking and all around fabulous! Love the combo of the bright teal and Kraft. Your color combo is stunning. The flower in combination with the zig zags is amazing! Beautiful color combo and LOVE the layering of the flower~! Congratulations on the new DT role! wow, love the color combo! great card!! Tracy! I love this! And the colors just knock my socks off!